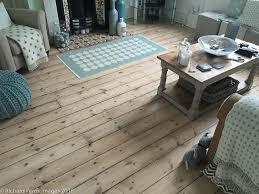 wood floor sanding Suffolk and the bleached white look. On this wood floor sanding Suffolk restoration project, It seems to be quite fashionable to a have a whitish bleached limed look on a floor. I have used soaps and lyes in the past which look good but these i find are not that durable and very high maintenance to keep them looking good. If your wanting this white bleached look or your are worried that the floor will look to orange or yellow with your oak floor or pine floorboards i have a couple of great finishes that achieve this look. One is Osmo hardwax oil, a great finish which comes in very very matt look or satin and also Junckers polyurethane floor lacquer but with a white primer which gives a great look and with outstanding durable top coat, either the Junckers Strong or Junckers HP commercial also in Matt or satin. I have recently sanded some victorian pine floors boards a tv room in Bury st Edmunds, Suffolk with the Junckers white primer and then two coats of Junckers strong and i have posted a photo up of this for you to take a look at. The room next door was sanded a couple of years ago and the difference between them was amazing.